In the constellation of Camelopardalis (also known as the Giraffe) is a faint star known as MY Cam. It appears faint because it is about 13,000 light years away, but its spectrum showed that it was actually a blue supergiant. Then recently, detailed measurements indicated that it was a spectroscopic binary consisting of two blue supergiants. Now a new paper in Astronomy & Astrophysics has revealed that the two stars orbit very, very closely. Brightness curve of the binary. Credit: J. Lorenzo, et al. In analyzing the binary, the team found it had an orbital period of a bit more than a day. They also found that the masses of the two stars were about 38 and 32 solar masses. Given their masses and orbital periods, the two stars must be close enough to share a common envelope. In other words, the two stars are basically touching, and their outer layers are connected. What makes this discovery particularly interesting is that these stars are also quite young (about two million years old). This means they must have formed very close to each other. 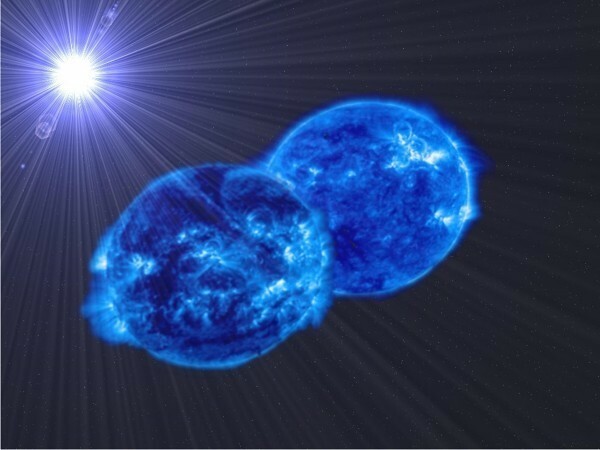 Binary stars such as this have been proposed as a way to form hypergiant stars, and this discovery gives support to this idea. Of course the big question is what will happen when they merge? Will it produce a supernova-like explosion, or will the resulting hypergiant star stabilize quickly. We’ll just have to wait and see. Brian, is it possible to to know the rate at which they are getting closer? Would this be affected by the inverse square law, because of gravity? I’d also love to know what’s going to happen when they merge. We don’t know at this point. We don’t have enough data to know their decay rate. The most agonizing thing about astronomy is that things take forever to happen! Then when they do happen they are over in an instant! Thanks for another interesting article.